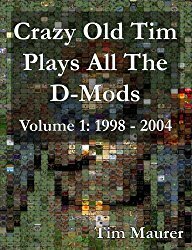 Crazy Old Tim Plays All The D-Mods Volume 1: 1998 - 2004, a 430 page physical book (!) is now available for purchase. For more details, please visit our book page. For those of you who missed previous posts about this, something really cool happened a few years ago. Tim Maurer (aka CocoMonkey) decided to play through every D-Mod ever released, and write about his experiences as he went. He decided to call this project 'Crazy Old Tim Plays All The D-Mods' (COTPATD). Along the way, he covered all 355 D-Mods, and wrote just under 300,000 words in total. His writing was pretty darn brilliant, and was witty, thoughtful, personal, and hilarious. Sadly, he died shortly after completing his project. Tim wrote COTPATD because he "wanted to give something back to a community that meant a lot to [him] when [he] was younger", and I believe that publishing his work in book-form continues that goal. COTPATD is a glimpse at our community through the silly games that we created together, and having that on a bookshelf makes it more 'real' than a web page that might disappear overnight. I think it is also important to recognize Tim's achievement, as sad as it is that he isn't around to see this. In editing COTPATD, I've fixed a few typos and grammar mistakes, and added a few missing screenshots. I've also trimmed out a tiny amount of content for formatting purposes. However, I've also added some additional 'context' to Tim's entries, including the community response to the COTPATD project, old forum posts, alternative reviews, and some historical snapshots of what was going on in the community while the D-Mods were released. I have this absurd fantasy in my head that after the apocalypse, COTPATD is one of the only books that survives. I imagine a future anthropologist in a white jumpsuit, carefully turning each page. They would start to understand a tiny slice of a few lives from the early 21st century, and hopefully start laughing all along the way. Oh, one more thing: earlier this year, I asked everyone I knew who was connected to Dink if they wanted to write a few words to include in the book, and I received responses from about 20-30 different people. Most of these responses will be included in Volume 2, but some are included in Volume 1. Awesome! Ordered the full color one! Fantastic job. Will order tonight. Thank you for your work Dan, this is incredible. If I may ask, and apologies if you covered this elsewhere, have you notified Dan's family about this/sent them a copy? Yes, earlier this year I contacted Tim's parents to confirm they were ok with the publication of this. I just confirmed again this month too, and ordered a few copies to send to them (they haven't arrived yet). Wonderful. Just to clarify, I wasn't questioning the permissions you got to do this or anything, I was just wondering if they were going to get to see it. Great work. I'd like to order but I dont exactly know how Amazon works. Do I have to pay in dollars if the currency in my country isnt dollars? gotta put it somewhere besides amazon. I'm not sure; it is available for purchase at several different international Amazon stores (like UK, France, and Germany). I read online that Amazon UK will ship to Romania, but I didn't find any information on how the currency conversion works. "I'd like to order but I dont exactly know how Amazon works. Do I have to pay in dollars if the currency in my country isnt dollars?" I've ordered from other Amazon sites a few times - they give you a choice, pay in dollars or pay in your local currency at their conversion rate. Just choose whichever is a better rate, Amazon's or your bank's. This is ducking gorgeous. Well done! Cool. I just put in an order for the color version. I wonder if I'm credited for coming up with the term "D-Mod" (because Seth didn't really have a name for them, and nobody had created any before) or if anybody other than us two even knew that. I didn't realize so many had been created. I was in it heavy at the start, then left abruptly for life reason, and just kind of moved on. I should talk about it on my podcast though. It was a very unique game, and great fun for its time. The ability to create add-ons at that time was truly amazing. PS: Wyndo, it's definitely possible and even likely you coined the term D-Mod - I don't remember that far back unfortunately! Just got the color version in the mail. It's much heftier and official than the pictures lead on. This an amazing project, thank you so much for you work Dan. I love this community. I just received my full color version in the mail. It is super cool! Very nicely put together. Great work guys! Unless something completely unexpected happens, Volume 2 will be released this month. "Yeah, we're a cult :) Playing a game made in '97 .. you'd have to be crazy.. or a cult :)" - Dukie The Dink Network ©1998-2998 Red Recondite.